Description: In the summer of 1962, a group of children on their way to the beach for the day discover a body. ​​We were like a swarm that morning as we left the house and headed along the street; all six of us buzzing and moving in a noisy, excited cluster. We swarmed around the corner, where the Caseys lived with their ferocious dog. The dog looked like Black Bob from The Dandy, but it was demented and out of control. It usually prowled around the Caseys’ front garden, growling and snarling and snapping at passers-by from behind the fence. Sometimes the Caseys left the garden gate open, deliberately, just to be cruel, and the dog would patrol the pavement instead, scaring people, defying them to get past. If any one of us children were on our own, or even if there were two or three of us, we would make a wide detour to avoid the Caseys. But not today. Today we were invincible. Sure enough, the dog was there when we passed, barking wildly as soon as it saw us. One of us – Mary, probably – decided to antagonise it by kicking the fence. The dog went apoplectic, barking more loudly, slavering, jumping at the fence, threatening to get over. Laughing and whooping, we all ran like the wind to the bottom of the hill, where we stopped to get our breath back before swarming along Station Road in the direction of Dalmeny railway station. It was a beautiful August morning, with hardly a cloud in the sky. It looked like it was going to be another hot day. We were on our way down to the sea, to spend the day at the Shellbeds. At thirteen, Ann Marie, my sister, was the eldest in the group and the appointed boss of it. Then there was me and my other two sisters, Lena and Mary. For each of the four of us, only a year separated our ages. Another sister and a brother were back in the house, but they were too young to come out with us. Making up our sixsome were Duncan and Andrew, the two boys from next door. Duncan was the same age as Mary, while little Andrew, at only eight years old, was the youngest of us. Both were fair and blue-eyed, Duncan with an unruly mop of curls the colour of dirty straw and Andrew with fine, straight hair so blond that it was almost white. The rest of us were raven-haired and brown-eyed – ‘just like Chinkies’, some older boys once shouted when they saw us all together. We had two straw carrier bags with us. Ann Marie carried the first bag, which was full of our towels and swimming costumes and trunks. I was responsible for the second bag, the one that Duncan and I would smuggle past the gatekeeper later on. It contained our food: the sandwiches that mum had made for us and some big potatoes that Duncan and Andrew had contributed along with a handful of table forks. There were also some plastic beakers in it. We would shortly add to the weight of the bag with our purchases from Cochrane’s shop across the road. The shop was a little wooden hut that had been painted green. It stood opposite the station’s ticket office at the entrance to the path that would take us down to the shore. It had a flat roof, a hatch that faced the road and a door at the side. You could make your purchases standing at the hatch or you could go into the shop by the side door if you wanted to take a closer look at the array of biscuits and sweets and drinks, all jostling for position on the shelves to your left and right and across the counter in front of you. Mr Cochrane sat in a wheelchair behind the counter. He was a small, thin man with streaky blond hair and a dwarf-like face. He was quite grumpy at first when we all squashed into the shop to examine his wares. But we were organised and remarkably quiet. Ann Marie was in charge of the money from mum. She asked each of us in turn to choose one item. Since most of us had probably decided what we wanted at least half an hour before, the process didn’t take long at all. She also bought two big bottles of Irn Bru and half a dozen packets of crisps. Everything was piled into the bag I was carrying. Mr Cochrane seemed much friendlier by then, even waving to us as we trooped out of the shop. We set off along the path at the side of the shop. The path was narrow and fenced on both sides, so we had to walk singly or in pairs. There was a corn field on the left and a steep embankment on the right. At the top of the embankment was the railway line that led from the station to the southern end of the Forth Bridge. When northbound trains whizzed past, you could see them clearly from the path and you could wave to the passengers. We hadn’t gone very far when we saw the body. It lay diagonally across the path, its head and back leaning against a fence post at the foot of the embankment, its feet pointing to the corn field. We were afraid of it at first, but when we realised that it wasn’t going to move we came much closer, some of us even stepping over it. The body was that of a small, heavy man in his forties or fifties. He wore a grey-flecked worsted suit and waistcoat, a shirt and tie, and a pair of black leather shoes. He had grey cropped hair, a round face and grey stubble on his chin. His eyes were closed, and he didn’t seem to be breathing. There was a large patch of congealed blood around his left ear. ‘Crikey!’ cried Andrew, who was fond of using terms that he picked up from the comics. ‘Is he dead?’ asked Ann Marie, not getting too close to the man. ‘Don’t be stupid,’ hissed Lena. ‘He probably fell from a train.’ Lena and Mary always disagreed with each other; they were mortal enemies. Everyone seemed to agree with the compromise, even Duncan. ‘I don’t know, but it’s his problem now,’ Ann Marie retorted impatiently. ‘Come on,’ she called to the rest of us. She stepped gingerly over the body and took her bag back from Lena. ‘Yeah, who cares?’ said Mary. We were approaching the footbridge at the end of the path when we heard her rumbling and hissing as she came round the corner. Recognising the sounds, Duncan, Andrew and I whooped up to the top of the bridge. Mary was close on our heels, but Ann Marie and Lena kept well back. Down below us was the single-track railway line from Dalmeny junction to the distillery in the Ferry. 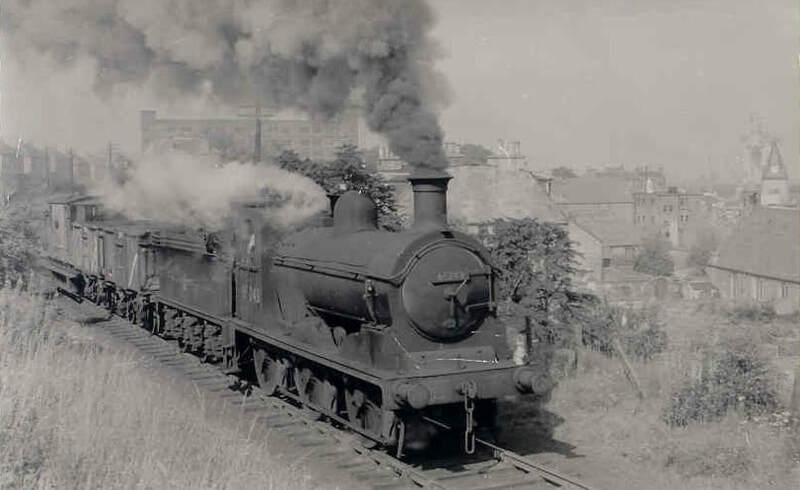 And there, charging along the track towards us, hauling grain from Haymarket in Edinburgh to the distillery, was old Maude in all her glory. In seconds, she passed under the bridge and we were enveloped in her hot steam, the fresh smell of soot thick in our nostrils; an unexpected treat. Maude was a familiar sight in the Ferry. She had been built before the turn of the century and had seen service in France during the First War. Everyone referred to her as an old lady, but she was actually named after a man, Lieutenant-General Maude of the Coldstream Guards, who captured Baghdad from the Turks in 1917. By the time Maude disappeared round another bend in the track, her shrill whistle echoing in our ears, we had all crossed to the other side of the footbridge, where we came to the first in the series of giant granite pillars that mark the beginning of the Forth Bridge. We seemed tiny as we stepped across the shadow of the pillar’s towering might to reach the top of Jacob’s Ladder, the massive staircase that would take us down to the shore. The staircase had been cut into a very steep, wooded hillside. Its two hundred or more steps were made of old railway sleepers, each step the breadth of two sleepers. There were wooden banisters along each edge of it, as well down its middle. And it was flanked on both sides by tall trees, mostly conifers, which grew as high as the bridge parapet directly above and which perpetually blocked out the light. Every time a train rushed past the tree tops, its thunder echoed down the staircase and its vibrations shook the hillside. We descended to the bottom of Jacob’s Ladder, emerging from its gloom and mustiness back into the sunlight at the foot of the Hawes Brae, which we crossed over carefully to reach the entrance to Shore Road. There before us was the estuary, its waters a deep blue, shining and sparkling in places. The green hills of Fife were visible in the background, the esplanade and the Hawes Pier in the foreground. A ferryboat was disgorging its passengers on the eastern jetty of the pier; another had just departed from the western jetty. Looming over this landscape and dominating it was the immense steel and stone structure of the Forth Bridge. We stopped for a while to take in the panorama, spreading ourselves along the low wall overlooking the shore, some of us leaning over its worn, flat top, all of us quiet for a change. We set off along Shore Road, a narrow, pot-holed track that curved round a small bay to Longcraig Pier and the gatehouse of the Dalmeny Estate. The track was bounded by a stretch of rocky shore on the left and thick, steeply sloping woodland on the right. We passed a low concrete building on the shore side. It used to be an anti-aircraft gun emplacement during the Second War, one of several that were constructed at that end of the Ferry to protect the bridge from the Luftwaffe, but now it was the Rustic Tea Gardens. Mum and dad took us all there once for a fish tea. It was a balmy summer evening, and we sat at a table outside on the balcony. I remember it getting dark and the moon coming out and seeing the silver reflection of the bridge on the ink-black water. Halfway along Shore Road, there’s a sharp bend in the track. If you went past the bend, you would have a clear view of the white wooden gate across the track and the cottage behind the gate. If the gatekeeper was standing outside his cottage, which he invariably did, he would have a clear view of you as you approached. He would have an even clearer view if he used his binoculars, which he also invariably did. If you squinted your eyes and looked just to the right of the gate, you would see a post with a small white wooden notice board nailed to it. From where you stood, you wouldn’t be able to make out the black stencilled lettering on the notice, but when you got up closer you would learn that, as a visitor to the Dalmeny Estate, you were prohibited from doing many things, including cycling, wheeling a pram, lighting fires and having picnics. If you were one of the local children, you would probably already have learned from bitter experience that the stern, grey-haired, bespectacled man with the binoculars enforced those prohibitions rigidly. And if you did have that experience, you would know that the man was a bully who said nothing to adults, but who picked on children unaccompanied by adults, searching any bags they carried and confiscating any food and drink he found, even forcing them to unroll their towels in the process. It was because of that bully that our group split up when we reached the bend in the track. While the girls and little Andrew continued towards the gatehouse, Duncan and I, with me still carrying the bag full of the so-called ‘prohibited’ items, ducked into the wood at the side of the track. Dodging from tree to tree, we clambered up the slope until we reached its crest, and then we moved along the crest as quickly and as silently as we could. We looked down through the trees and bushes as we went, catching glimpses of the gate, the gatekeeper, the gatekeeper’s old black Labrador, the rear of the gatehouse and the chicken run beside it. When we were well past the gatehouse, we descended the slope and hid behind some trees at the side of the track until the others appeared. Once the group was reunited, we resumed our journey to the Shellbeds. The track was now heavily wooded on both sides, the tops of the trees joining together to form a thick canopy, through which only the odd shaft of sunlight was permitted to penetrate. We stopped at a clearing on our left. In a dip in the clearing, there was a small well, which was surrounded by a metal fence that was rusted and broken in places. The gate for the fence had long since disappeared. Some people called this Queen Margaret’s Well, claiming that the queen drank from it on her way from Edinburgh to Dunfermline to marry King Malcolm Canmore. We knew that our own town was named after Queen Margaret, because she crossed over to Fife from there on the same journey, but none of us believed the story about the well; even to us children, it seemed far-fetched and contrived. Nevertheless, after clearing the dead leaves from its surface, we all took a drink of the well’s cold, sweet water. Not far from the well, we went down another clearing on our left, leaving the track altogether this time to take a path through the trees. If we had continued along the track, we would have come eventually to Dalmeny House, the stately home belonging to the Earl of Rosebery. According to many people, Rosebery owned not only Dalmeny House and the Dalmeny Estate, but also the very land that the Ferry was built on. Even our own street was named after him. His main home at that time was Mentmore Towers in Buckinghamshire. My sisters and I knew that because our mum had worked at Mentmore Towers when she was younger. She went into service there during the War, another fresh, young Irish girl straight off the farm. Coming from Eire, a neutral country, she was classified as an alien for the duration of the War. She was employed as an upstairs maid, and thus she was required to travel with Rosebery’s entourage whenever he came to Dalmeny House. That was how she got to know the Ferry and to meet dad. For a long time after she left Rosebery’s employment to settle in the Ferry, his butler, Chad, and his housekeeper, Grace, who were married to each other, took the opportunity to visit mum – ‘young Mary’, they continued to call her – and her new family every time they travelled up from Mentmore Towers. Mum used to tell us stories about her time in service. She said that Rosebery was ‘a mean, old bugger’. Even although he could have had a brand new pair of pyjamas for every night of the rest of his life, her job each evening before his lordship retired was to darn the tears in the one pair of pyjamas that he always wore. She also spoke about Rosebery’s son, Neil, whom she referred to as ‘young Lord Primrose’, and the times at Dalmeny House when he and his friends drank champagne into the early hours of the morning and cavorted naked in the courtyard fountain. That was during the years of austerity immediately after the War, of course, when there was rationing for the hoi polloi and champagne for the toffs. Our pace quickened and we began to buzz again as we followed the path, first through a series of tall, spreading trees and then through a forest of ferns so high that we couldn’t see over them. The ferns came to and end abruptly, and suddenly we were there in the brightness and heat of the Shellbeds. We saw that familiar sweep of soft golden sand; the rocky promontory at the far end of the inlet; and the sand dunes, which grew bigger and steeper the closer they got to the promontory. There between the sand and the softly lapping waves was the three-foot wide strip of shells of all shapes and sizes and colours that gave the place its name. And there was the water itself, clear and blue and shimmering, its sandy bed sloping very gradually out to sea. We had all been there many times before, but we still stood for a few moments to take in the wonder of the scene. We were lucky: it was a beautiful day during the school holidays, but it looked like we had the place to ourselves; our own private paradise. We took off our shoes and socks and headed excitedly towards the dunes at the far end. ‘Cripes!’ shouted little Andrew when his bare feet first touched the hot sand. None of us was wearing a watch, but we could tell by the signs that it was time to go home. The tide was going out fast, a chill breeze was sweeping across the wet sand left by the departing water, and we were all tired, thirsty and hungry. It had been a great day. We had chosen a cleft between two of the biggest dunes in which to lay out our towels. We knew from experience that we would be shaded from the sun there and protected from any wind that got up. Duncan, who seemed to excel at that sort of thing, made a ring of stones and lit a fire in it. Then he tossed the potatoes into the blazing fire. While the potatoes cooked – ‘burned’ is probably a better description – we ate our sandwiches and crisps, gobbled our sweets and drank the Irn Bru. Those of us who had a taste for charcoal then used the forks to retrieve the charred potatoes from the dying embers of the fire and had a go at eating them. Afterwards, we paddled and splashed and waded in the shallow water, and played battleships with pieces of driftwood. Some of us found a jellyfish on the sand and proceeded to bombard it with stones and sticks to make sure that it didn’t float away with the tide. When we were tired of the water, we had a competition to find out who could jump and slide the furthest from the top of the biggest dune. We also took turns at leaping into the sand from the top of the concrete pillbox that lay half-submerged under the adjacent dune; another relic from the War, the pillbox had been sealed years before. Towards the end, we played a game of hide-and-seek among the huge ferns and trees that bordered the clearing above the dunes. The clearing was wide and flat and covered in soft grass kept permanently short by generations of rabbits. After traipsing back through the ferns and then the trees, we stopped at the well again for a good while until we had all slaked our thirsts. As we passed the gatehouse, the gatekeeper, his wife, his dog and even some chickens were out in force, but we warranted hardly a glance from any of them; they were more interested in who was coming into the estate – and what they were carrying – than who was leaving it. The Rustic Tea Gardens was opening its doors for the evening when we reached the end of Shore Road. We paused for a minute or two at the same low wall overlooking the shore, watching the toing and froing of the ferryboats, shielding our eyes from the bright orange glare of the setting sun. Jacob’s Ladder seemed like a mountain to climb. It took an age for all of us to get to its top. There was no sign of old Maude up there, though, no diversion this time, so we carried on along the path that would take us to Station Road and closer to home. We had started off the day as a swarm, but now we were a straggle, walking slowly in single file, long gaps between us, the gaps widening as we progressed, me at the front, then Duncan and Andrew, then Ann Marie and Lena, and finally Mary a long way behind. Our limbs were aching, and our skin was tingling and beginning to tighten from the long exposure to the sun and sea. Cochrane’s shop was shut when I got there. I waited for Duncan and Andrew to catch up. We waited, in turn, for the girls to join us. We would all cross the road together. It was only when we had formed a group again that we remembered the body from that morning. But there was no-one to ask about it. It didn’t matter, though; we were all too tired to care.